New mobile tracking data shows that within two days of its release, Apple's iOS 7.0.6 security and maintenance update —which repaired a potentially critical SSL-related bug —was already installed on more than 13 percent of iPhones and iPads in North America. iOS 7.0.6 became available to the public last Friday, and even though the following two days were over the weekend and there were no new features to end users, initial adoption was strong. 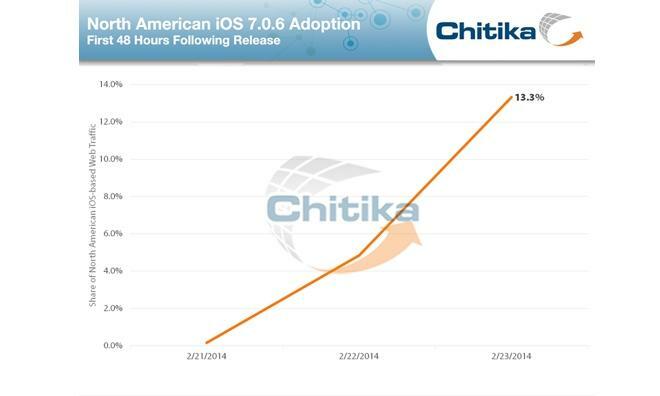 New data published by mobile analytics firm Chitika on Wednesday shows that 13.3 percent of iOS traffic in the U.S. was driven by iOS 7.0.6 just 48 hours after the update was released. The data is based on tens of millions of U.S. and Canadian iOS-based online ad impressions generated though Chitika's ad network. Those impressions were tracked from Feb. 23 through 23, and encompass both iPhone and iPad. The firm believes it's possible that a majority of North American iOS device users will be using the latest version of the mobile operating system by next week. 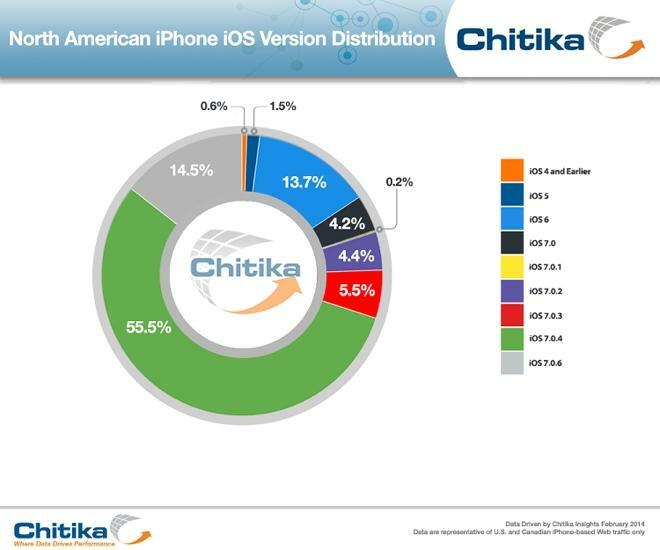 That would mean that users are updating faster than they used to, as Chitika's data from iOS 5.1.1 showed that it took close to three weeks to reach 58 percent adoption. As of Sunday, the most popular form of iOS was version 7.0.4, accounting for 54.1 percent. In terms of the latest major iOS release, more than 84 percent of all North American devices tracked are running iOS 7. A more significant update to Apple's mobile platform is expected to arrive next month in the form of iOS 7.1. AppleInsider has been told that the update will debut in mid-March with a number of tweaks intended to address issues with crashing, and also to speed up animations in the operating system.